The cheesy, unwanted gifts have been returned, the festive decorations have been put away and the New Year’s fireworks have faded. Yes, the holidays are officially over, but don’t worry, there’s still fun to be had. Start out 2015 strong with a weekend in Las Vegas. We’ve got a convention full of the latest James Bond-y gadgets, bars where you can catch the playoff football frenzy and much more. Like the latest gadgets? You and 150,000 of your closest geeky friends can hit up the Consumer Electronics Show (CES) this week through Jan. 9. CES is the world’s largest gathering of people in the business of consumer technology. At the show, which is held in Vegas every year, you’ll get to see groundbreaking technology and the coolest new electronic stuff from more than 3,500 exhibitors. There are always lots of businesses in Vegas that offer specials to convention goers. Need a drink after a long day of salivating over the latest TVs, phones and video games? Trevi inside The Forum Shops at Caesars has just the thing. They’ve created a specialty “Techitini” cocktail for the occasion and CES participants can also enjoy a 10 percent food discount. Just present your convention badge. 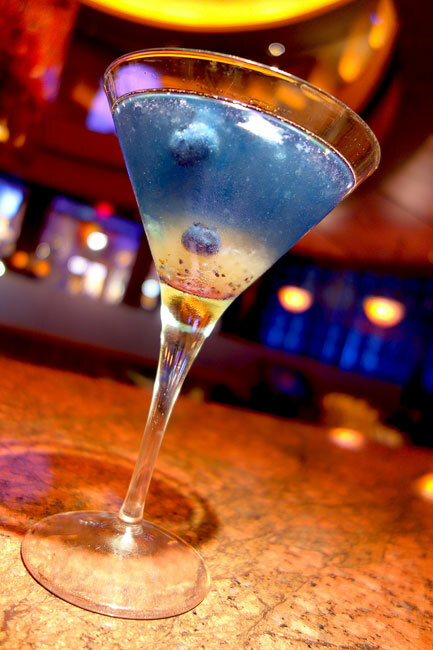 The Techitini ($10) is a tasty combination of orange vodka, homemade orangecello and blue curacao with a sugared rim. CRUSH eat, drink, love at MGM Grand will offer a specialty chef’s tasting menu for CES Jan. 6 – 9. Priced at $75 per person, the menu will include octopus ceviche, ricotta gnocchi, wood fired pizzas, grilled salmon and beef hanger steak. Dessert is the Sweet Elvis, a peanut butter flatbread topped with bananas and bacon. Thank you. Thank you very much. Things are getting serious for football fans this weekend. It’s the NFL Divisional Playoffs on Saturday and Sunday. Put on your jersey and your face paint and cheer on your favorite team or cheer against your rivals at lots of bars and sports books around town. Rhumbar at The Mirage turns its outdoor patio into a festive football celebration during the playoff games. You’ll find drink specials including $6 Coors Light beer and $25 Coors Light beer buckets. The specialty Spike It! shot is a shot of Fireball Whiskey dropped into a glass of Stella Artois Cidre hard cider. We suggest celebrating your team’s touchdowns with one. Other specialty drinks, each priced at $10, include the Hail Mary, a signature bloody Mary made with Hangar One Vodka. There’s also a menu designed for football fans including chicken wings, nachos, a hot dog served with skinny fries and a quesadilla. Numerous high-definition televisions are located throughout the venue for optimal viewing of every play. After a long weekend of conventions and football viewing parties (especially if you did a lot of those Spike It! shots) you might need a bit of the hair of the dog on Sunday morning. Have no fear, LONGBAR at the D Las Vegas is here to help you. 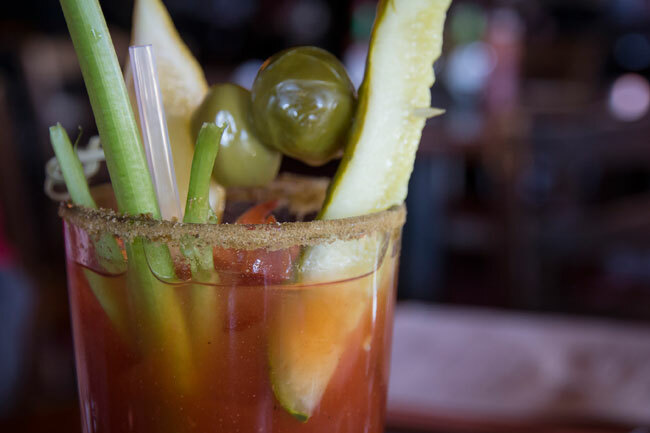 Head down to their Sunday Bloody Bar for some relief. The bar stretches the entire length of the casino (hence its name) and features tons of flat-screen TVs for watching even more football games. Every Sunday from 9 a.m. – 2 p.m. you can design your own bloody Mary concoction with a huge array of unique mixers (chili spice, barbeque flavor), liquors and toppings like thick-cut bacon, beef jerky, hearts of palm, pickled asparagus or egg, smoked oysters or mussels. It’s a sure cure.